You are here: Home / Gear and equipment / Hiking gear – what are the basics to get started? Starting out hiking and don’t know what gear to buy? What hiking gear do you really need and what is considered a luxury? Should you believe everything the salesperson in your Outdoors Store guarantees you will need? What is the best hiking gear? Our Hiking Blog received an email from Megan and we thought it was a great opportunity to canvas different opinions from people we respect in the Outdoor blogging world. Several people have agreed to post their ideas on what is the best way to get set up with hiking gear. This is the first guest post by Nik, the founder of the Bushwalk Tasmania forum. He lives near Launceston in Tasmania and is a great writer and very valuable resource. Nik has excelled himself with this post and his input is very much appreciated. 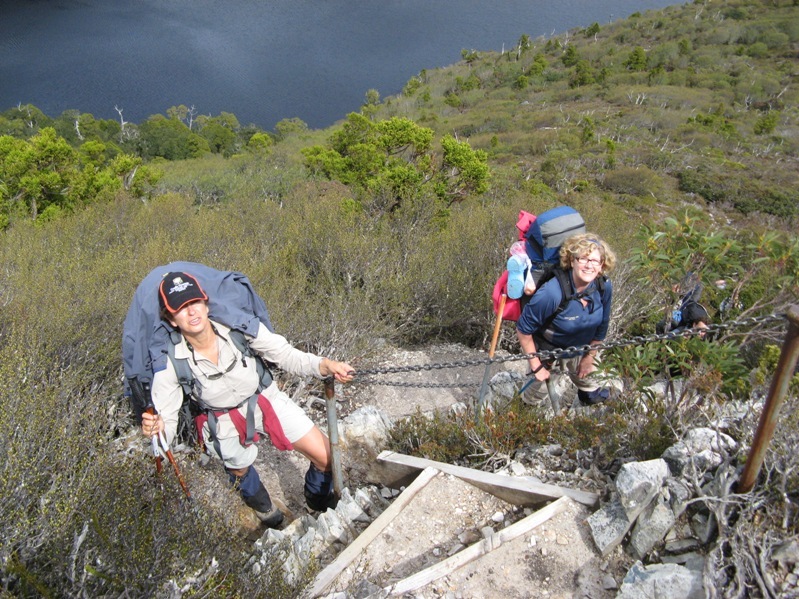 Remember, the Bushwalk Tasmania forum is a great spot to visit, join and interact with other hikers. My partner and I want to start doing some hiking, starting out with overnighters and then building up to some multi-days and Tassie!! But we’re complete novices with no idea of what we really need to get started, and my credit card could simply not take an afternoon of Paddy Pallin, a silly grin and me saying yes to everything that is offered. We’ve camped before but always with others who were organized and had a lot of gear, and in warm climates. We’ve certainly never packed our own cereal in snap lock bags! So what do we really need – what would set us up as a basic kit that we could add to over time? What are the things that even a beginner should spend their money on – and what are luxuries that can be updated over time? Sue, Clare, Colin and Gary in Dixon Kingdom Hut – the Walls of Jerusalum – everyone as different gear but all with the one goal – to keep warm! It was -3.0C in there. Firstly thanks to Frank for the opportunity to post on his blog. It’s a quality site choc-a-block with useful information. I’ve learned a bit from “Our Hiking Blog” myself. And thanks to Megan for asking the questions that I bet every new walker wants to know. I’m no expert, but I’ll do my best to offer some advice based on my own experiences, and of others I’ve talked to. Obviously, the first thing you need to do is figure out what you need. If you’re inexperienced, some of the required gear may not be obvious at first. 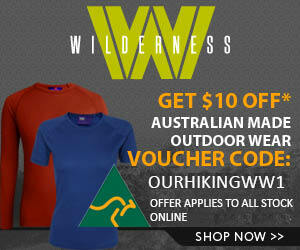 There are many places where you can find lists of what to take bushwalking, including websites and books. My own complete list (along with those of several others) has been posted to a Bushwalk Tasmania forum topic : What gear is essential? You could also include clothes (especially wet weather jacket) in this list, but clothing is an entire topic all of its own that I won’t go into here. I reckon that once you’ve got the 5 items listed above, and your clothes, the rest of the kit is relatively easy. When selecting equipment, the only way to be truly sure which is the correct choice for you is to try out all the options for extended periods in a variety of conditions. Of course, this is not an option for most of us, and it is only after many years of walking that I’ve really been able to figure out what my preferences really are. So the next best thing you can do is talk to as many experienced walkers about their own preferences. The problem with this is that everyone uses equipment differently, and has different priorities. So when listening to others’ opinions, it’s important to understand how and why they’ve made their decisions. For example, free-standing tents (eg, dome tents or others with crossing poles that hold their shape without being pegged down) are easier to set up, are easier to move around, and form a much more rigid structure. However, tunnel tents, although marginally harder to set up, usually shed wind load better due to their flexible shape, and therefore may better in high winds. So it depends on where and how your most likely going to use your tent. If possible, get involved in organising a few walks before you buy your gear, rather than just tagging along and letting others organise everything for you. This will help to get you thinking about the requirements from your own unique perspective. Below are a few specific tips for the 5 essential items I listed above, from my own perspective. It’s really important to get this right, as you’re going to be walking on them all day, every day, carrying an additional 15kg, or so (all of which is carried by your feet, in the end). When listening to advice and preferences from other people on boots, keep in mind that everyone has different shaped feet. After hearing how good Scarpa boots were, I bought a pair that felt great in the shop, but after walking for a few hours in the bush I realised that they were too narrow for my feet and compressed my little toes a bit. Having paid hundreds of dollars for the boots I used them for over 10 years, but was uncomfortable on every one of those walks! This goes to show that they were great boots (lasting over 10 years) but that they were not quite right for me. I’ve since heard of other people who’ve had similar problems, so it’s worth trying to find out if you have narrow or wide feet, and which boots are best for your feet, not for somebody else’s. If you plan to do a lot of hard walking, durability is a big concern. Hard walking can really trash boots. I’ve met people on the Overland Track with the soles coming off their supposedly good quality boots after only a few days of walking. Boots take a lot of stress while walking, particularly on rough rocky tracks, and you need to make sure that whatever you buy has a reputation for durablility. My current (and 3rd) pair of boots are Raichle and I’m very happy with them (after about 3 years of walking). They have Gortex lining, which I’d rather go without in boots, but it appeared to be the trend at the time, and it was impossible to find boots I liked without Gortex lining. I always buy full leather boots, with as few seams as possible. My two primary concerns with a pack are comfort (it’s going to be a lot of weight on your back for a lot of time), and durability. I have seen a pack come apart during a bushwalk, and if we didn’t happen to have enough bits and pieces to get it functional again, it would have been a disaster. You MUST try out a pack before buying it at least under a reasonable simulation in the shop. This means getting somebody who knows what they’re doing to help you adjust all the straps, putting some kind of heavy load in it and walking about at least around the shop. If you feel ANY discomfort whatsoever, do NOT buy the pack, you can be sure that it will get a LOT worse after a few hours of walking. Like boots, packs can be trashed in long hard walking conditions, scraping through bushes, past trees and rocks. But most of all, if you plan to ever do any really hard walks where pack-hauling is required, this can wear through fabrics very quickly. So you need to make sure that the pack is constructed using a tough fabric, and is well put together. My current (and 3rd) pack is a One Planet ‘Strezlecki’. It is far superior than my previous two packs and I’m very happy with it, but only after about 30 years of walking, and about 4 years with this pack, have I realised that my ideal pack would actually be a One Planet ‘McMillan’ (which is almost identical, but without the lower zip opening). You need to consider where you’re likely to walk and what the temperatures can be like there, as well as your own metabolism – some people sleep hot and others sleep cold. I’m a cold sleeper, and I walk in Tasmania at all times of year, so I went for a very warm sleeping bag. In fact it is so warm, that most of the time I just use it like a doona. My current (and only) sleeping bag is a J&H ‘Winterlight’ (J&H merged with Aiking to form One Planet many years ago). The one and only time I’ve ever had the zip fully closed and the muff and hood fully closed was sleeping out in the open on the verandah of Kia Ora hut in the snow, because the people in the hut snored to much. Of course the first factor to consider is how many people do you want to sleep in the tent. For most people this is either 1 or 2. Then you should think about if you want much vestibule space (for storage, and/or cooking during rain). Personally, I’m happy to leave my pack out in the rain all night, so long as everything I might need is in my tent, but I do want a decent vestibule for cooking. Make sure the floor is truly waterproof (although you can use a groundsheet/footprint under the tent as well). Water seeping through the floor of the tent ends up soaking into everything else and gets very uncomfortable. The only way to do this is to ask people who’ve used the tent in a lot of wet weather. Ventilation is also very important in tents. Ideally you should have vents at both ends to allow air to flow through, otherwise the inside of the tent will end up very wet from condensation (even with good ventilation the inside can get a lot of condensation overnight). My current (and second) tent is a MacPac Olympus. It’s a large two person tent with an absolutely waterproof floor (a thin but tough rubbery fabric), two large vestibules, and the best ventilation I’ve seen. It’s larger than I really need (even when walking with my wife) but that means I can enjoy the luxury of having most of my gear unpacked inside the tent all night. I’m considering getting a smaller tent as well for when I walk alone, or don’t want to share my tent, as the Olympus is quite heavy. The main differences are the type(s) of fuel they use, if/how they integrate with other cooking items (pots, handles, etc). Gas is easier to light and easier to control and cooks hotter, whereas metho is useable at higher altitudes – not that there are very high altitudes in Australia. Other fuels include shellite, unleaded petrol and diesel. My current (and only stove) is a Trangia (the largest model) metho stove. I like how I get two pots, a fry pan, a kettle and windshield all in one neat package. Many people do not need all this, but I often walk and share with others and sometimes need to be able to cook for 3 – 5 people at once. I’ve got two modifications to my Trangia: Firstly, I’ve bought the tiny Trangia stand which is barely larger than the burner itself, and I take it along with a standard billy and the pot handle when walking alone for a very tiny lightweight kit; secondly, if walking with 4 or more people, I strap a large steel wok to the outside of my pack. This sits nicely on top of the Trangia and can cook a meal for a large group. I believe you can get a gas conversion kit for a Trangia, which sounds ideal to me. My last tip applies to all of these items: You get what you pay for. Unfortunately, you do have to spend a lot of money to get really good quality equipment – there is no way around that. Although some brands are overpriced, it it very rare to get really good quality items that will last a long time for a cheap price. There are exceptions – my first tent cost $90 and lasted about 15 years before getting torn to bits in a wind storm, but it was not terribly waterproof, particularly in the floor. If you have any more specific questions, I’m sure Frank would be happy to hear them, or you could ask them at Bushwalk Tasmania where novices and experienced walkers are always welcome. Enjoy your walking (and your shopping! ), and be sure to let Frank and the rest of us know what you bought, and how it performs on your walks. Only thing I will add here for anyone reading is not to be put off Scarpa boots – I am onto my 3rd pair (my 1st pair were stolen & 2nd pair is still a work pair around the garden). What Nik says is correct – they need to be right for you. They are expensive though, the full leather mens boot is nearly $400 if you paid full price. This thread has given me a great idea – I am now thinking of doing a pictorial (got the camera gear, might as well use it) of preparation for my next walk – including bagging / preparting my food, packing my pack and what order and why, also waterproofing certain things in my pack. Stay tuned for that. Agree tasadam, I have Scarpa boots and love em. Agree with the picture post re packing. Had the same idea. Might post mine here and check out your’s at Bushwalk Tasmania!! Boots are not a requirement for most walks. For a track walk any reasonable pair of runners should be fine, and the walking shoes available are excellent. I have a pair of Merrell’s. As John Chapman suggests joining a club is a good idea, have a look at several to find one which matches your interests and age group. They usually have rental equipment or other members may loan equipment. This is a lot cheaper than renting from a bushwalking shop, but that may be another option if your only doing a couple of walks a year. For winter add: Monmouth cap, wool mittens, spare wool weskit, wool shirt. These are rolled up inside the blanket. Good list for the 1700’s. Pretty heavy gear but world have worked well. Does it work well for you now? Truly a very good read for anybody kitting up for the OT. Questions about whether gas or shellite stoves are best; a friend’s OPTIMUS gas cooker performed poorly on a recent walk at 1,660m ASL in —3°c conditions, whereas my Whisperlite fired up immediately. The OT is not at this altitude, but can still get very, very cold. Would need to carry more shellite than gas methinks (= more weight).I would be walking with my Mont Moondance 1 (ruled out leaving it at home and ‘hutting’ from stop to stop after talking with many others who have done the OT). Would be a great help to many for people to post their ‘packing pictorial’ identifying what is what and the weight. Granted, by the time one does the OT packing what you need, and not what you think you might need (within disciplined reasoning) is the norm and nothing is left to the off-chance of being packed but never used. I would highly recommend a diverse resource for discourse re the OT. Many Tassie walkers are seasoned “serial OTrekkers” with a vast wealth of experience, so I tap into them on Bushwalking Australia. I don’t think you can ever have too much knowledge. Thanks for dropping by Gary. I agree, very happy to post up here anyoneones lists of geat or pictures of what they tak hiking. There is a really comprehensive gear list in our Overland Track ebook including explainations about why we take things!